What a coup it was for Dacapo to secure the Wiener Philharmoniker for their live recording of Per Nørgård’s First and Eighth symphonies; indeed, it was one of my top picks for 2014. 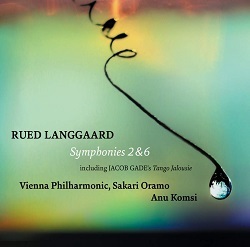 Like this new Langgaard release, that was also conducted by Sakari Oramo, who, as chief conductor of the BBC Symphony, is very busy in both the concert hall and the recording studio. His recent Chandos album of works by Florent Schmitt is not just a sign of inveterate industry but also of a willingness to explore unusual repertoire. Enter the eccentric Dane, Rued Langgaard, whose quirky oeuvre I first encountered in Music of the Spheres; that Dacapo disc, with the Danish National SO under Thomas Dausgaard, was soon followed by their splendid traversal of all sixteen symphonies. Given the somewhat peripheral nature of this music, it’s not surprising there are very few recordings of it in the catalogue. First up is a Danacord set from the early 1990s, with the Artur Rubinstein Philharmonic under Ilya Stupel. Also in 1991, Neeme Järvi and the DNSO recorded Symphonies 4 to 6, which I have as a 16-bit download from Chandos.net. Then, in 1998, the Dausgaard cycle got under way (it took a decade to complete). In the meantime, Danacord issued a 2-CD set of Nos. 4, 6, 10, 14 and Music of the Spheres; these ADD recordings, set down between 1977 and 1981, were conducted by John Frandsen, Ole Schmidt and Michael Schønwandt. Rob Barnett reviewed that album at the time of its release in 2001. Appropriately enough, the DNSO – full title DR SymfoniOrkestret – is the orchestra involved. Langgaard isn’t in the Wiener Philharmoniker’s bloodstream, but then neither is Nørgård’s. And steeped though they are in the Austro-German tradition, they’re not strangers to Nordic rep, as their classic Sibelius set with Lorin Maazel – superbly remastered on Blu-ray Audio – so amply demonstrates. Factor in the presence of Oramo, a Finn, and a label celebrated for their top-notch sound, and the auguries for this new release seem very good indeed. For the sake of comparison, I listened to all the alternative versions listed above. Of course, couplings could be a deal-breaker, but it will be fascinating to see how the competition stacks up. With his search for a Romantic/Symbolist idiom, Langgaard set himself against the somewhat dour Danish musical establishment. That said, his early symphonies are broadly traditional in style. No. 1, ‘Mountain Pastorals’, has a Straussian surge and Brucknerian amplitude that probably helped ensure the work’s success at its premiere, in Germany, just before the Great War. (Langgaard was always more popular there, and in Austria, than he was in his homeland.) As I noted in my review of Dausgaard’s account of No. 2 – the original version – the sumptuous first movement is followed by a middle one of ‘almost classical symmetry’. However, I wasn’t entirely persuaded by the finale, with its setting of ‘Spring Sounds’, by the German poet Emil Rittershaus (1834-1897). So, how does Oramo fare in this work? As expected, the cascading strings, noble horns and glorious weight of the WP are mighty impressive in the opening movement, the music’s Wagnerian overtones more pronounced than ever. What I particularly like here are the jolly martial episodes and sense of Straussian gemütlichkeit, although even in this retro-piece there’s an elemental quality to the writing that looks much further north, to Nielsen and Sibelius (cue a thrilling, brass-shot climax at opener’s end). Oramo builds and shapes the middle movement most beautifully, helped in no small measure by the ravishing sounds of the greatest orchestra on earth. And it’s a measure of the conductor’s skill that the finale, with soprano Anu Komsi a clear, ringing soloist, suddenly seems less ‘problematic’ than it once did. As expected, the recording itself is beyond reproach. Revisiting Dausgaard’s recording, coupled with No. 3 (6.220516), reminded me of the set’s musical and sonic virtues. However, his account of No. 2, sensitively directed and very well played, now seems just a little earthbound next to Oramo’s wonderfully nuanced and insightful one. In mitigation, the hushed intensity of the DNSO’s playing in the central movement is a wonder to behold. And although soprano Inger Dam-Jensen sings well enough in the finale, she has a fairly wide vibrato that bothers me more now than it did then. No qualms about No. 3, ‘The Flush of Youth’, whose ebullient piano and lusty choral parts bring to mind Busoni’s mammoth piano concerto. The sound in both works is well up to the standards of the house. Now for the really interesting bit. The Artur Rubinstein Philharmonic, based in the Polish city of Lodz, may not be a household name, but their seven-volume Langgaard series, directed by the Lithuanian conductor Ilya Stupel, is actually rather good. Admittedly, they opt for the revised, much shorter version of No. 2, but it’s still a fine piece. The first movement is robust, cohesive and, in quieter moments, suffused with a lovely Romantic blush. And although soprano Roma Owsinska is a powerful and compelling presence, she lacks Komsi’s subtlety and expressive warmth, especially in the song’s more inward moments. What a pity the coupling, a decent performance of No. 3, is sans choir. As for the early Drapa, written in memory of Grieg, its as dreary as ever. Still, the Danacord sound is refined and spacious throughout. The Sixth Symphony belongs to Langgaard’s ‘third phase’ (1925 to 1945). At the outset Oramo gets the WP to play like a distinguished and attentive chamber group, the lower strings rich and firm, the upper ones as silky as one could wish. The darkly bracing brass in Thema II are a treat, and Preben Iwan’s fine engineering ensures timps, bass- and side-drums are superbly rendered. For his part, the conductor builds climaxes of seat-pinning weight and power; not only that, the symphony’s Ivesian irruptions are effortlessly handled, its Nielsen-like passages emphasised at every turn. Most impressive, though, is Oramo’s surefootedness, the work’s architecture – its burning conviction – revealed as never before. And goodness, what a pate-cracking peroration at the end! Which brings me to Frandsen’s Sixth, recorded live on 9 December 1977 and first released on LP as EMI 6C 063-38100. Like Järvi, he emphasises the score’s detail and distinctive sonorities, and that’s rewarding in itself. Happily, the analogue original doesn’t show its age, with plenty of bite and big, uncluttered climaxes. And, not surprisingly for a conductor known for his Nielsen, he’s alive to echoes of the latter in this music. The finale, artfully prepared for, may not be as overwhelming as the best, but it’s still stirringly done. Not the tidiest or the most perceptive performance, perhaps, but worth hearing nonetheless. Indeed, that applies to the rest of this collection, No. 10 directed by Schmidt and No. 14 by Schønwandt, fine Nielsen interpreters both. Presentation and balances do vary, but otherwise sound is just fine. Also, there’s some applause. Breaking news: Oramo’s new recording is one of the best things I’ve heard all year. Of his fillers, the gentle meditation Upaaagtede Morgenstjerner (Unnoticed Morning Stars) is most welcome; Jacob Gade’s loud, rather garish ‘gypsy tango’ is eminently forgettable, though. Booklet notes are by the ever-reliable Jens Cornelius. Unexpectedly, this composite review has been very instructive. First, it’s reminded me what a passionate, powerful and endearingly quixotic talent Langgaard was, and how much joy there is in his work. Second, it’s demonstrated that, in their various ways, all the albums mentioned here do justice to these underrated symphonies. And third, it’s highlighted the sheer consistency and musical value of that Dausgaard box.